Visitors play a crucial role in protecting and preserving Pantai Hill. Visitors like customers have the power to regulate the resorts, through their voice and patronage. By telling our story, we hope that responsible visitors and resort guests will find their own ways to help and give back to the hill they love. 1.Please be vigilant regarding the level of noise you personally create or your group creates. Please do not shout or scream in excitement (as most groups do). 2.Please understand that Pantai Hill is not a party venue outside of KL. 3.Please respect the people who reside nearby, to honor their right to healthy lives and peaceful enjoyment of their homes. We make a clear distinction between a resident’s one-off gathering vs the consistent gathering of groups hosted by resorts. In the event that this plea is not respected, the police have agreed to monitor and help residents maintain tranquility and peace on the hill. Each year more and more rubbish gets deposited on the hill. The carelessness of workers and visitors add up. Please avoid throwing anything onto the Pantai Hill grounds. Please bring out every eventual trash you help create. Large groups have negative impact on the surroundings (especially when exploring the river and jungle trekking). Consider traveling in small groups for a higher quality holiday experience. Water is a limited resource (especially high quality spring water with no flouride and chlorine) on the hill. Please use with careful discretion. We discourage the building and operation of more swimming pools due to its water commitments. This is especially worrisome during the dry season. 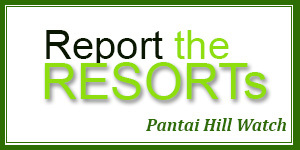 We hope in the future, VISITORS of Pantai Hill can help regulate the resorts themselves by not participating and not patronising them, if they are deemed guilty of misbehaving for the purpose of profiteering at the expense of others.